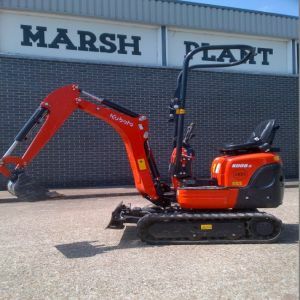 Modern hydraulic excavators come in a wide variety of sizes. 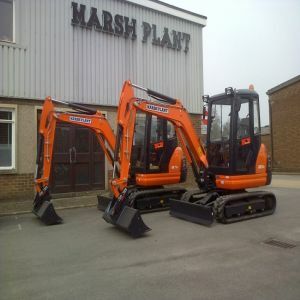 The smaller ones are called mini or compact excavators. 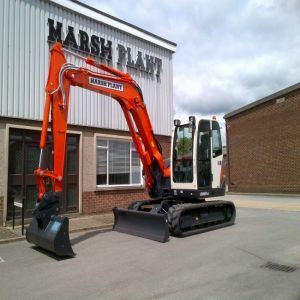 Before the 1990's all excavators had a long or conventional counterweight that hung off the rear of the machine to provide more digging force and lifting capacity. This became a nuisance when working in confined areas. In 1993 Yanmar launched the world's first Zero Tail Swing excavator, which allows the counterweight to stay inside the width of the tracks as it slews, thus being safer and more user friendly when used in a confined space. This type of machine is now widely used throughout the world. Hydraulic excavator capabilities have expanded far beyond excavation tasks with buckets. With the advent of hydraulic-powered attachments such as a breaker, a grapple or an auger, the excavator is frequently used in many applications other than excavation. Many excavators feature a quick coupler for simplified attachment mounting, increasing the machine's utilization on the jobsite.